It's been a little hectic the past couple days. 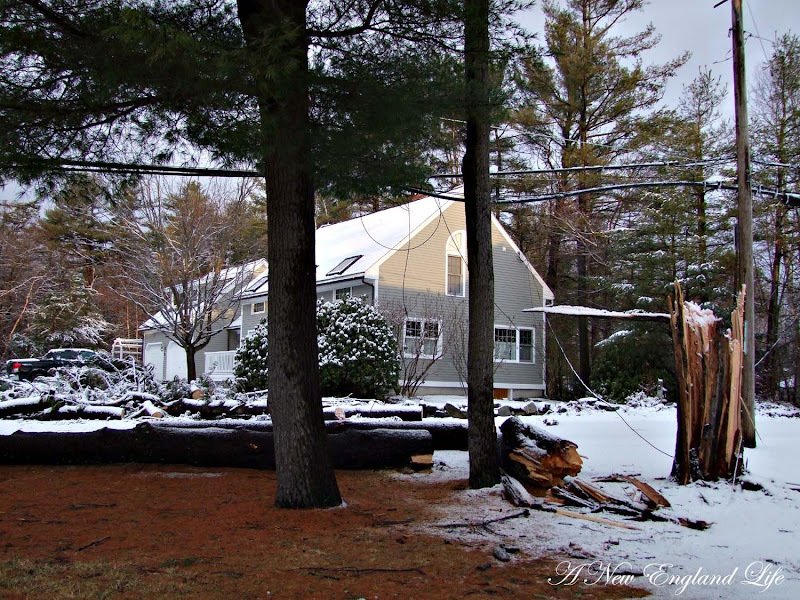 Like my other New England bloggers we had a huge rain and wind storm here in New Hampshire, Thursday morning into Friday morning. My husband was so worried we would get water in the house but luckily that never happened. Instead, like most every other house, we lost our power. By late Friday morning it was back on. Internet, phone and cable came back on this afternoon. Others haven't been so fortunate. This is the next road over from ours, and a pretty common scene. Believe it or not there's a driveway under that tree! Fast forward to 6:45 this morning. There's a little restaurant behind all those trucks. NH has help coming from as far away as Michigan. I'm not sure where those trucks were from, though I imagine the workers had been up all night. What a shock to wake up to snow! Quite beautiful but not if you don't have power. And these people, like thousands of others, don't. I headed down to New Castle to get some shots of the sunrise and ocean. When I saw this I didn't think I'd get there. Luckily they re-routed the traffic through a parking lot and into New Castle commons, my exact destination. That was as far as I could go. 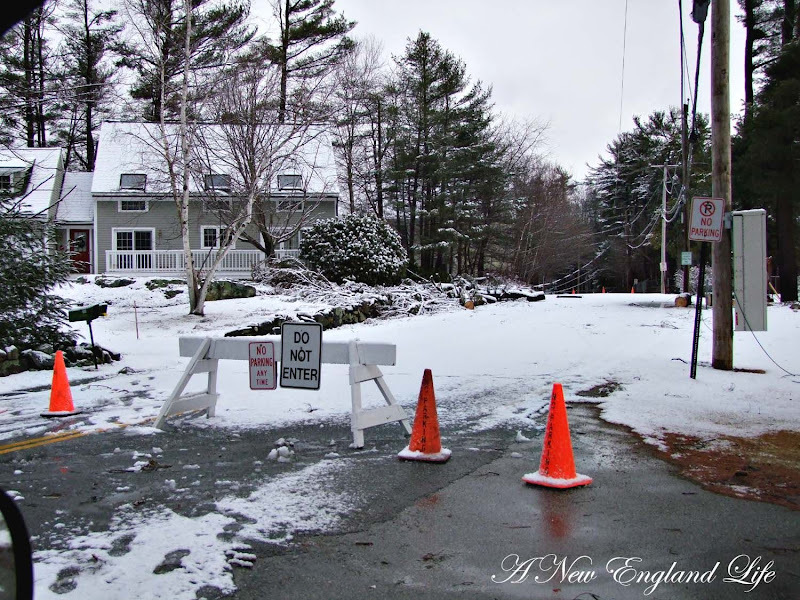 The rest of the road was blocked off leading to Portsmouth. More trees down I imagine. Here's another road not to far from where I live. My daughter was so scared for me to drive underneath but everyone else had done it so we did too! If you look in the background you can see a snow covered wire just above the road. We just cleared it as we drove underneath. As we came to the end of the road we were met with these guys. God love em. They were everywhere and people gave them the right of way. Formulating a plan I would guess. 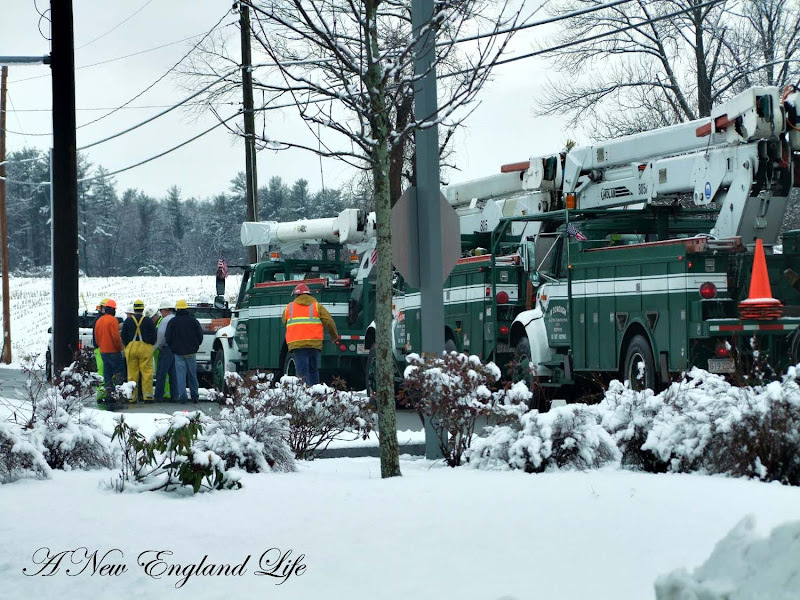 The power companies and tree guys seem much more organized and coordinated than they were during the ice storm of December 2008, when some people lost their power for over a week. However, they're telling us it will be several days before everyone has power restored. 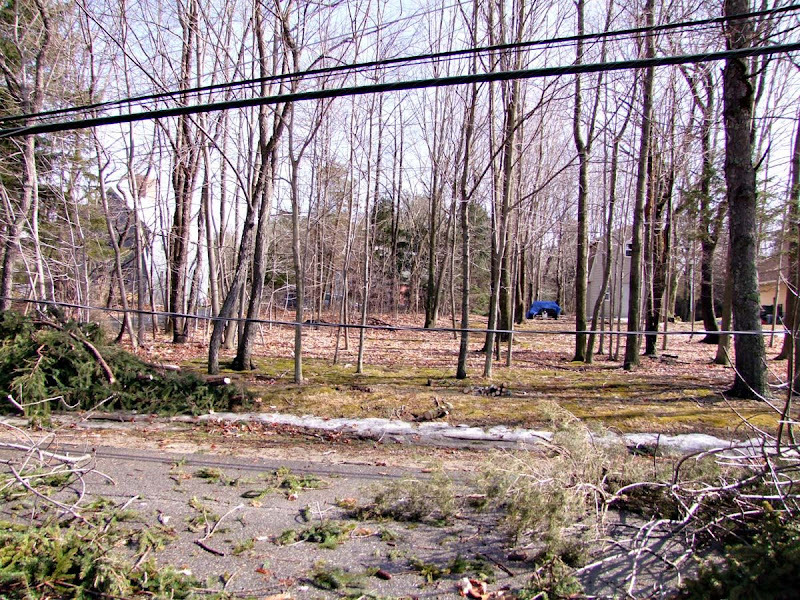 There's just so much damage from the extremely high winds. Mother Nature is sure a powerful old gal! I am ready for Spring, too! Go away winter! Wow, that is crazy. I hope no one was hurt! We had a lot of snow here in NY, but nothing to that effect! What a mess, Sharon! 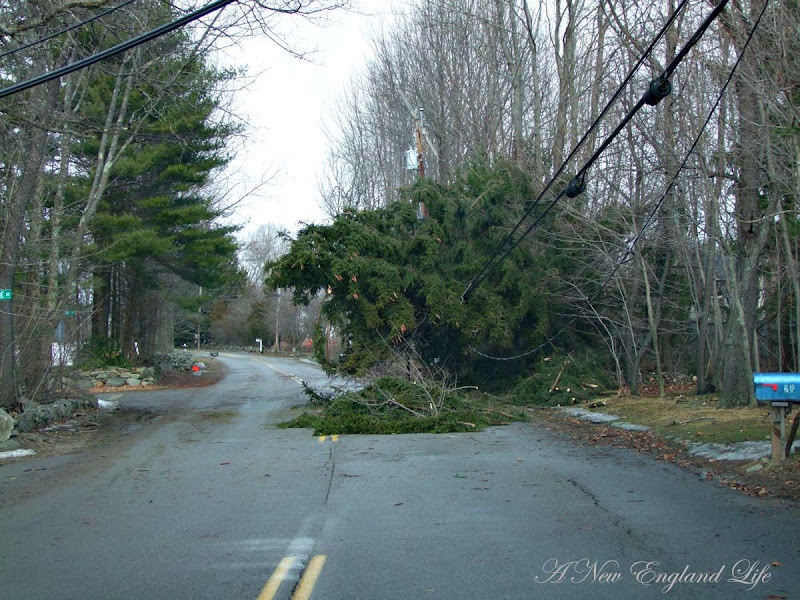 Those downed lines are always scary, but it looks like lots of help is there to get everything restored. No power in this cold weather stinks! Wow! Hope they get everyone's power back on soon. With out power in bitter cold temps can get bad. We have had major power outages here more than once. That sure is some storm Sharon. I am pleased there was no car parked in that driveway. Winter is the worst time to sit without power too isn't it? I can imagine it feels so weary to see this week after week Sharon. God bless the guys who come out and work tirelessly to see that power is restored! Oh, Sharon. I was wondering how you guys were all doing up there. 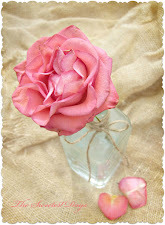 These photos are excellent and thank you for the links to other bloggers in the area. Sometimes I wonder why I live in the Midwest, but it's my home...freezing temps, ridiculous amounts of snow, and ugly slush in the Spring. Your pictures were great...Thank God for those who help us! Oh my goodnes...you captured mother nature wonderfully! Stay safe my friend! WOW! 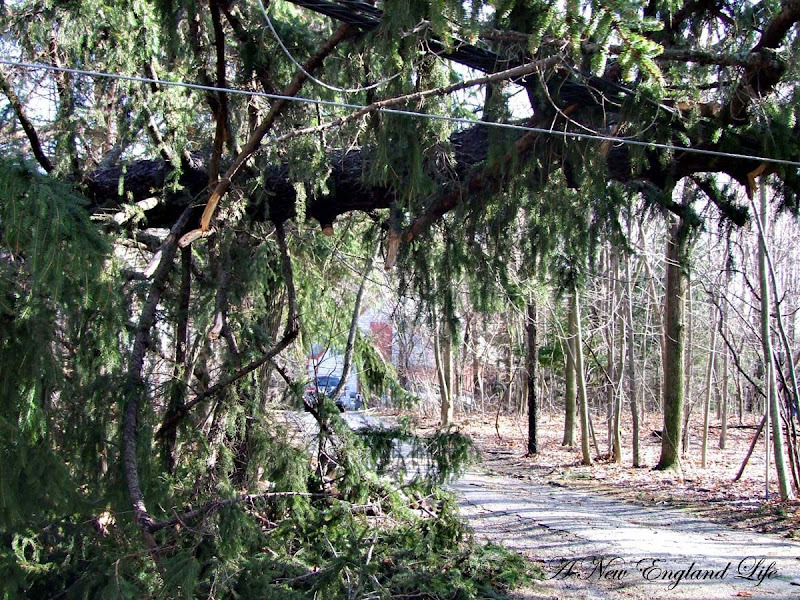 I am so sorry you had to go through this....those downed trees look humongous..and I am glad no one was hurt. You took some fantastic photos of the area in distress though...thanks for letting us see it through your lens! Yikes! I enjoyed all this photos ..setting the scene for what its like there ..what a storm..
guess the wind really made it worse. Great shots Sharon! 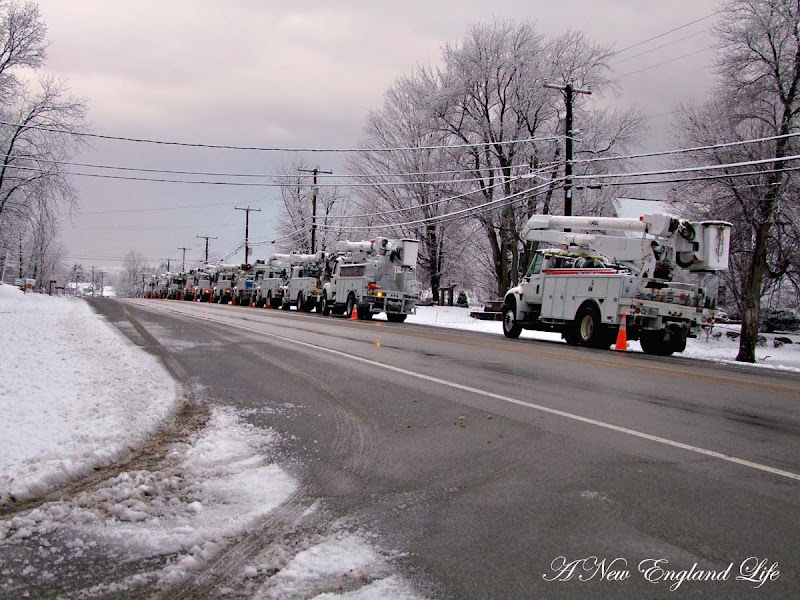 I just came home and like there many utility trucks from all over the northeast all around town. It seems like here also the pines didn't weather the storm so well! I'm so glad to hear you're ok! I guess I've been living in a bubble. I hadn't heard it had gotten that bad up there. We only had rain and mix of snow. I ran into people in town saying the weather here was bad....are you kidding? we got nothing. We are such wimps in Southern NE. You guys are the real deal!!! Hugs and stay warm and safe! It's just so sad to see those big beautiful trees on the ground. We don't have many trees out here in the high desert. It all looks very beautiful. Stay warm! 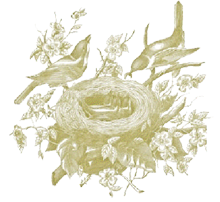 i am glad you are with electric now....i didn't realize ya all had such a bad storm up there....i knew about the snow south from you. hubby used to be a lineman.....many years ago. he still works in electrical distribution to make sure those trucks get to the right places. it sounds like maybe some his company's trucks maybe heading north because of this storm. what a headache for everyone. 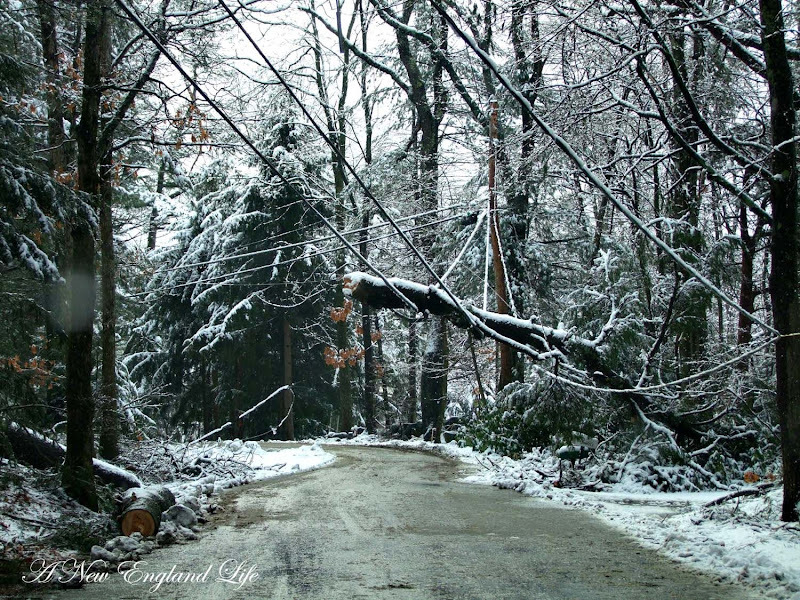 i am like your daughter watch out for those downed lines...yikes! hubby says, don't do that! too. Wow, Sharon, some of those are massive trees, those were some winds. Great shots! I heard the winds off the coast were stronger than the lowest hurricae winds. We got the snow, about 16 inches. Mayor had to call off school for the second day in Feb, though he had vowed not to the night before. I used to wish for big storms like this, because they are so exciting, but as I get older, all I can think is the aftermath! If all the power is restored in less than a week, you will be doing better than Ontario and Quebec did in 1998, when we had the big Ice Storm. Even now, if you do not qualify which ice storm, it is assumed you mean that one. We only lost power a couple hours, but others were without for three weeks, if memory serves. Wow, looks like the seacoast got hit hard with this one. Feel free to send those trucks over Manchester way when they finish up there! 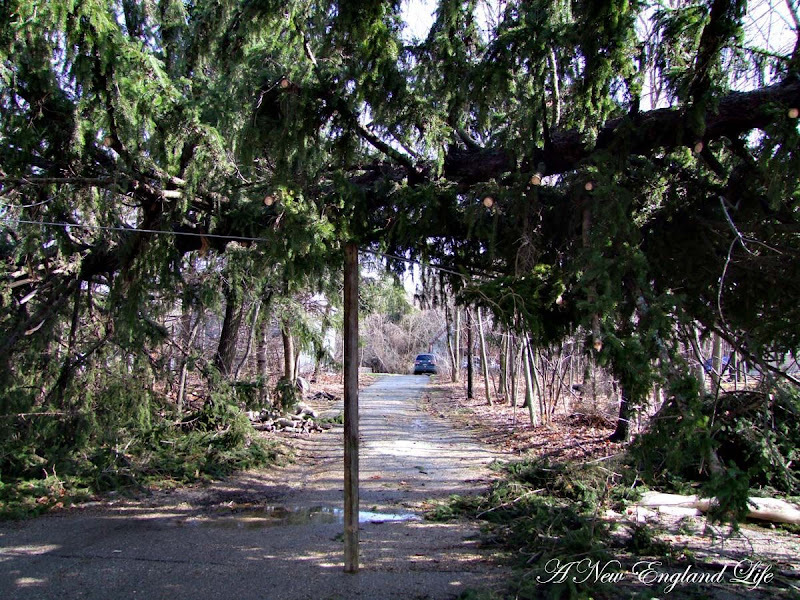 My Dad lost two 150+ year-old Cedars that flanked our Cape farmhouse in Maine. What a shame. He was nearly in tears when he told me. Wow, we got off very lucky here in the Adirondacks. I am counting my blessings. Wow! That was quite the storm! That was quite a storm! Thanks for showing us some photos of the damage. You've got some interesting shots there! 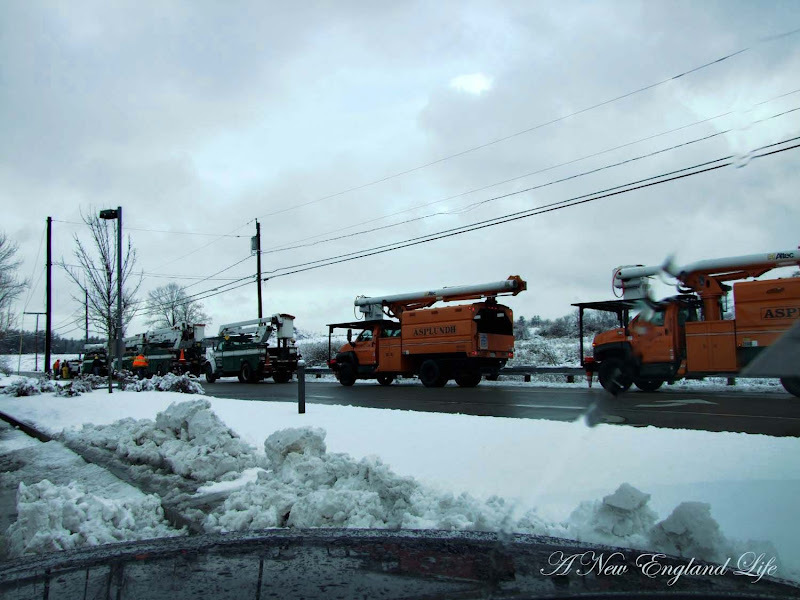 I have a lot of clients who are powerline construction companies and they have been out of state all winter long working to restore power to folks. Very dangerous job.